Pet Guard Cage, Hutch and Litter Tray Cleaner has a special pro-biotic formula which is the strength behind this cleaning formulation. Pet Guard is suitable to use on cages, hutches, litter trays and other types of animal housing, leaving behind nothing but cleanliness. This special formula completely eliminates all traces of urine and odours which help prevent bacterial infections diseases and uric acid damage to housing. 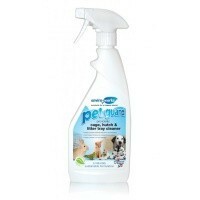 PetGuard Cage, Hutch and Litter Tray Cleaner is free from harmful chemicals and is pet safe.